Additional information about the Steven-B Tug Boat Graphic: The Tugboat Steven B is owned by Bennett/Foster Yeoman and operates on the River Thames London, she is 25.24m long. 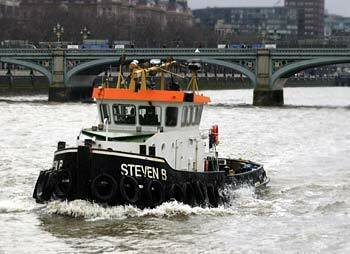 Siteseen Ltd. are the sole copyright holders of this Steven-B Tug Boat picture, unless otherwise stated. We only authorise non-commercial picture use and particularly encourage their use for educational purposes. This Steven-B Tug Boat picture is not in the Public Domain. 1) www.educationalresource.info must be credited as the copyright holders wherever this Steven-B Tug Boat picture is used. 3) Use of this Steven-B Tug Boat picture, or any of our pictures on websites re-distributing copyright free material is strictly prohibited.